In this lesson, you will learn the basics of GPIO usage on Linux, being able to read or write to a GPIO pin from command-line, as well as by developing a minimal C application. Understand how to translate the hardware pin names to the correspondent Linux sysfs interface numbers. Assemble the additional hardware - an LED and a switch. 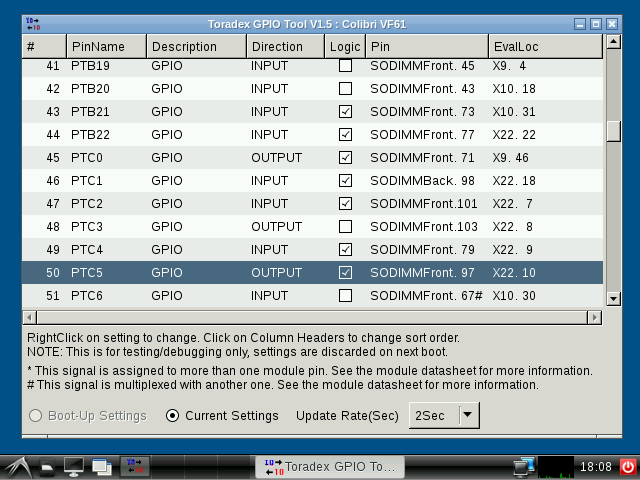 Use the Toradex GPIO Tool to validate the hardware setup. Configure and use GPIO pins through the Linux sysfs. Write minimal sample applications in C.
The information provided in this guide is based in Toradex's knowledge base article GPIO (Linux), as well as other knowledge sources such as kernel documentation and the Linux man-pages project. Note: On this getting started we are going to use 2x Resistor 2k2Ω, but you can use anyone between 1kΩ and 10kΩ. For Resistor 470Ω, you can use anyone between 100Ω and 1kΩ. For the transistor BC548, you can use any switch component you want, as MOSFET, just change the circuit according to the component. To find out which GPIO number to use in the Linux sysfs interface, you have to know the correspondence between available pins in the carrier board, number of the correspondent pins on the MXM3 connector of the Apalis computer on module and number of the pins on Linux. For this introduction guide, some pins configured by default as GPIO in the Toradex BSP were chosen. The choice of pins was made based on their availability on all the carrier boards covered by the getting-started guide. This module will not go through the configuration of other pins as GPIO, although it is possible. Note: The notation CONNECTOR.PIN will be employed in this lesson, e.g. X12.5 means pin 5 of the X12 connector. Have a look at the table available in the "TK1 Functions List" chapter of the Apalis TK1 datasheet. 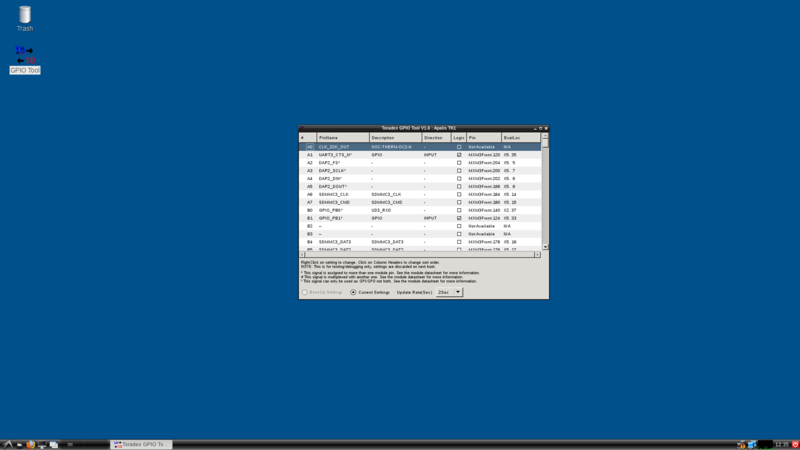 It provides a list of most of the Apalis pins available on the MXM3 connector. The MXM3 pins we are interested at are connected to the TK1 SoC and have names defined by the TK1 Ball Name function. Each pin is multiplexed to have a specific function - among them GPIO, therefore the GPIO function is the column that we are interested at. On the formula above, the x is a character, you need to find the number corresponding to the alphabetic letter, as example A=1, B=2, C=3, AA=27. Use jumper wires to connect GPIO 147 to GPIO 150. 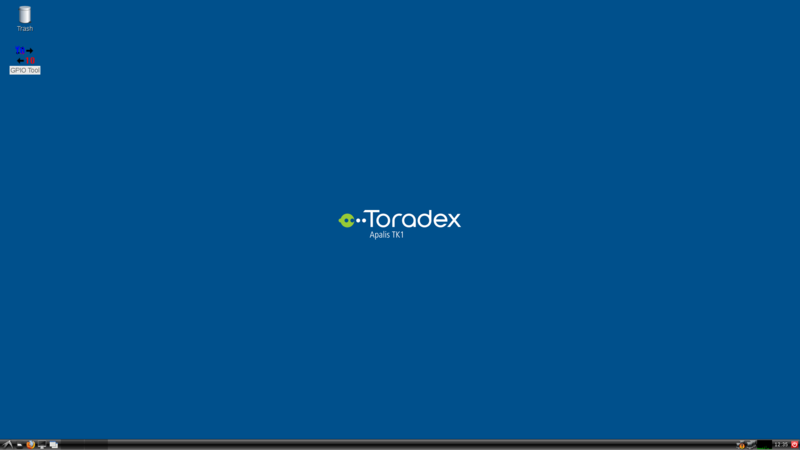 The Toradex Linux pre-built image comes with a tool named Toradex GPIO tool meant for debugging pins configuration. It can also be used to determine the correspondences found in the previous step. We will use it to test the hardware connections. Note: You need a display and a mouse connected to the system in order to use the GPIO tool. Please go to the beginning of the getting-started guide for more information about assembling the peripherals. Locate the pins 248 and 237 in the table. Right click the direction of each of them and configure pin 248 as INPUT and pin 237 as OUTPUT. See the changes reflected in the application. Click the Logic checkbox of pin 237 and see the logic checkbox of pin 248 switch on/off. The Linux sysfs interface provides an abstraction to access the GPIO, as well as many other hardware features, from the Linux user-space. The pin has to be exported first, which guarantees that it is not being used by other kernel drivers nor allow other drivers to use it. It also has to be configured as input or output. Use jumper wires to connect GPIO 237 to 2k2Ω Resistor , connect the resistor to transistor base pin, connect pin X27.12 (5V) from Ixora to 470Ω Resistor , connect the resistor to one LED and connect to transistor collector pin, connect the transistor emitter pin to pin X27.7 (GND) on Ixora Carrier Board. 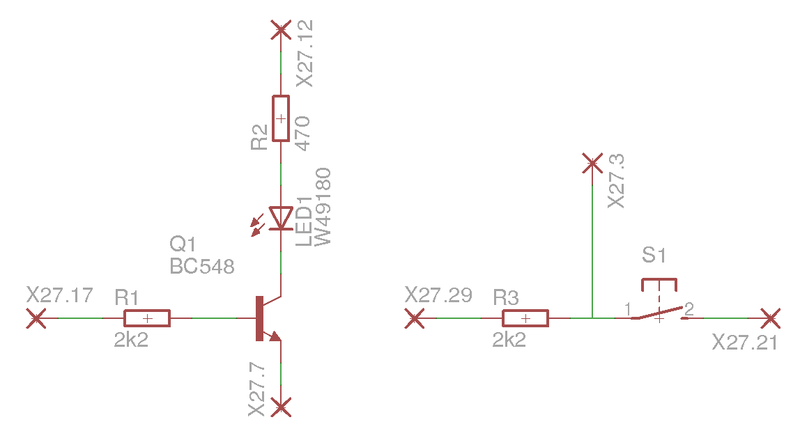 Use jumper wires to connect pin X27.29 (3,3V) to 2k2Ω Resistor , connect the resistor to one switch and to GPIO 248, and connect the node to pin X27.21 (GND) on Ixora Carrier Board. Note: If the module was rebooted the GPIO must be exported again as explained in Step 8. See that the pins 248 and 237, configured as input and output in the previous steps, are the only ones taken by sysfs and are correctly configured as in and out respectively. Export, unexport, configure and toggle the GPIO pins as you read the debugfs information to see the changes. Note: If you want additional pin configuration debug, explore the /sys/kernel/debug/pinctrl/ directory. 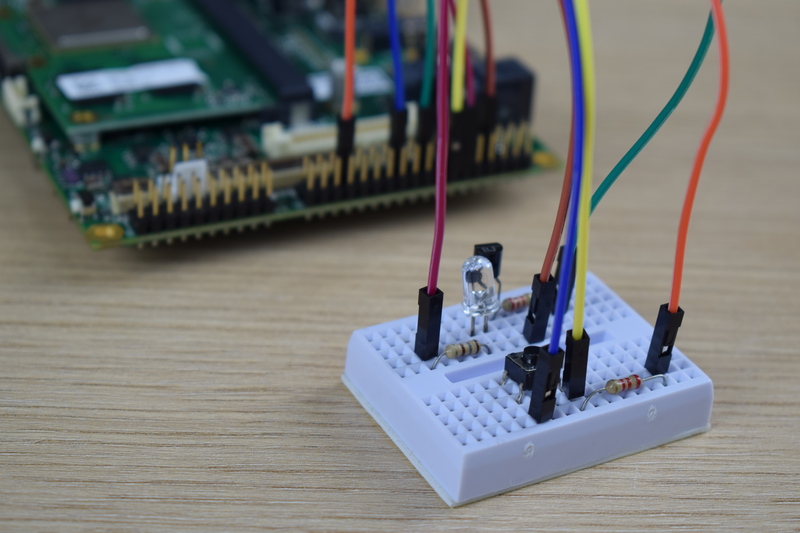 Write a small C application that toggles the LED GPIO. A small source-code is given below for reference and you may copy-paste it to your previously configured Eclipse environment. Copyright (c) 2017, Toradex All rights reserved. Redistribution and use in source and binary forms, with or without modification, are permitted provided that the following conditions are met: * Redistributions of source code must retain the above copyright notice, this list of conditions and the following disclaimer. * Redistributions in binary form must reproduce the above copyright notice, this list of conditions and the following disclaimer in the documentation and/or other materials provided with the distribution. * Neither the name of the Toradex nor the names of its contributors may be used to endorse or promote products derived from this software without specific prior written permission. THIS SOFTWARE IS PROVIDED BY THE COPYRIGHT HOLDERS AND CONTRIBUTORS "AS IS" AND ANY EXPRESS OR IMPLIED WARRANTIES, INCLUDING, BUT NOT LIMITED TO, THE IMPLIED WARRANTIES OF MERCHANTABILITY AND FITNESS FOR A PARTICULAR PURPOSE ARE DISCLAIMED. IN NO EVENT SHALL Toradex BE LIABLE FOR ANY DIRECT, INDIRECT, INCIDENTAL, SPECIAL, EXEMPLARY, OR CONSEQUENTIAL DAMAGES (INCLUDING, BUT NOT LIMITED TO, PROCUREMENT OF SUBSTITUTE GOODS OR SERVICES; LOSS OF USE, DATA, OR PROFITS; OR BUSINESS INTERRUPTION) HOWEVER CAUSED AND ON ANY THEORY OF LIABILITY, WHETHER IN CONTRACT, STRICT LIABILITY, OR TORT (INCLUDING NEGLIGENCE OR OTHERWISE) ARISING IN ANY WAY OUT OF THE USE OF THIS SOFTWARE, EVEN IF ADVISED OF THE POSSIBILITY OF SUCH DAMAGE. Write a small C application that reads the switch GPIO. A small source-code is given below for reference and you may copy-paste it to your previously configured Eclipse environment. To prevent the main loop from blocking, run the GPIO IRQ handling in a separate thread. Try to implement it. This lesson only covers the basics of GPIO usage on Linux. Since there are other important topics that were not discussed, this FAQ section is meant as an information complement. sysfs is a ram-based filesystem initially based on ramfs. It provides a means to export kernel data structures, their attributes, and the linkages between them to userspace. Often there are kernel modules for dedicated purposes, which are preferred to implementing on your own. Examples of such are the control of LEDs, display backlight and power management. In addition, there are hardware interfaces that may best suit your purposes, such as the PWM interface and other peripherals. Browse this FAQ for reference regarding these alternatives. You have to browse the computer on module datasheet and/or device-tree in order to verify that the pin can be configured as GPIO. After that, you must customize the system device-tree in order to change the pin configuration. You may consider using a GPIO expander. Please see the question "How can I use more GPIOs than available for a specific module?" above. All Toradex modules come configured to control a display backlight. For such purpose, one of the hardware PWM interfaces and a GPIO, as well as the Linux kernel backlight API, are employed. The PWM interface is responsible for controlling the display brightness, and the GPIO for toggling it on/off. To use a GPIO as a power management input, you have to alter the device-tree and create a udev rule. Additionally, a GPIO can be used as an interrupt source to wake-up the system from a low-power state. The MXM3 4 is defined as the wake-up pin by default. Please see the question "Is it possible to use a GPIO to shutdown the system?" above. If there isn't a kernel driver that suits your needs, you can access GPIO from kernel space rather than user space, and use the gpio.h kernel library. There are other ways to access GPIO registers directly either from user space (using mmap) or kernel space (using ioremap). Those are problematic since they bypass the kernel handling of the GPIO controllers and might lead to unexpected behavior. Each SoC defines its own initial state, therefore the SoC manufacturer reference manual have to be consulted. The pin configuration can be set in the device-tree. It is also possible to make changes in the bootloader, if very early configuration is unavoidable. 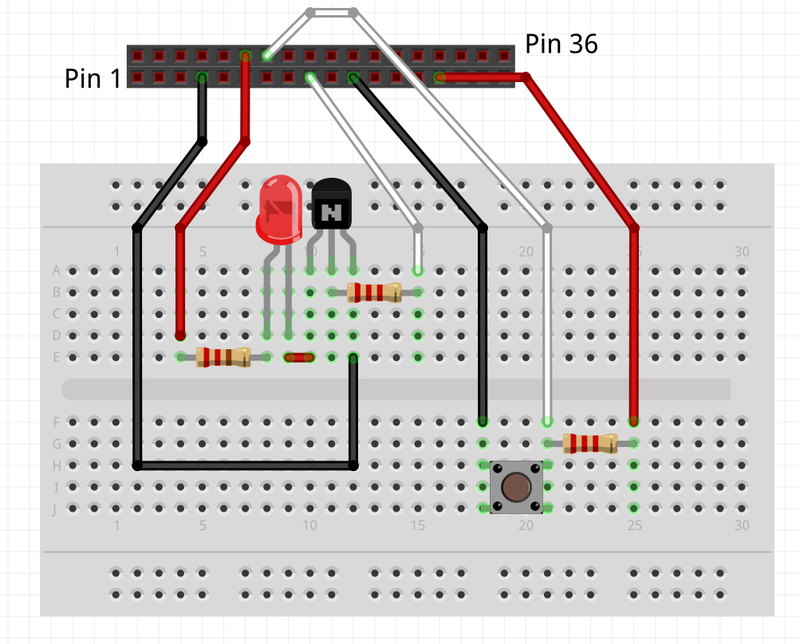 Please see the question "What is the initial state of a GPIO pin?" above. The behavior is not well defined for every module, depending on the provided BSP. If this knowledge is really required, you might verify the kernel GPIO/pinctrl subsystem.